One of my duties in the nest is to provide adequate sustenance to all my little fledglings. Lately we have been a little more health conscious to maintain our weight for wrestling championships. While I abhor the idea of cutting weight for a growing child just so he can make it to a more conducive weight bracket, I am for healthy eating and if we can all benefit even for a couple of weeks of less grain and far less sugar while increasing our protein and vegetable intake, well I’m all for that! So in lieu of maki rolls we crave for sashimi and edamame, although eating out is rarely an option with us (especially when we must avert the bread basket) I have been trialing with a variety of green ingredients. 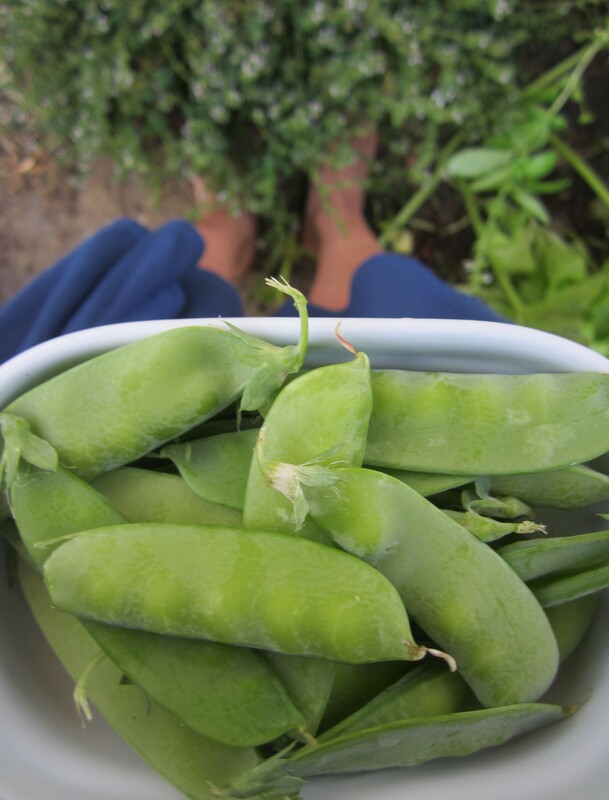 Snap peas have always been a favorite of mine; they barely emerge into our kitchen—a direct flight from the harvest into my mouth. They are sweet and recently I have incorporated the leaves into our gastronomy. My favorite veggie patties are home made with whatever is in my fridge or growing in the garden patch. The greens de jour in our nest are escarole, zucchini, kale, snap pea leaves and parsley. Tabbouleh salad of course is what manifested from the bundles of parsley from the garden—it’s a weekly thing for us and of course hummus. This time I tossed in a few sprigs of snap pea leaves and bumped up the zest with extra lemon to offset the sweetness of the greens and the hummus still was a hit. I learned a tip from COOKIE + Kate regarding extra creamy hummus…is there any other way to eat it? In fact, it’s the only way I spoon it right from the bowl…extra creamy. This time I dolloped a few scoops onto my veggie patty, Papa Bear and Middle Bear preferred a fried egg on top of their veggie patties. While we haven’t omitted dessert entirely from the repertoire, I made coconut milk ice cream sweetened with coconut sugar and fruit and then there were these adopted from My Name is Yeh. Instead of tahini, I used peanut butter since we had plenty of it in our nest. When baking I use coconut oil instead of butter (even for the frosting.) Canola oil is never an option (it didn’t stand up to the olive oil in our kitchen as a child) it’s still not welcomed in the nest…here’s why. Now that spring has arisen from its wintery rest, remember to look for seasonal vegetables at the market—a whole new garden fair is out there to be discovered in your culinary realm with the change of season. Happy healthy feasting! Good luck with the menu…hope you’re able to stock up soon. I live to eat meat and hummus. Your hummus looks quite delicious…can’t wait to taste some! Thanks, yes I have perfected the hummus dish and won’t mess with variations too much. I hope you do get to try some soon…don’t worry I will make your very own non-sharing bowl of hummus. If you make it by next week you can have a shank of lamb too! So lovely to come visit your blog, thank you for commenting on mine 🙂 Those veggie paties sound delicious and I love that you used such a variety of greens. Delicious! Happy Easter! So lovely to have you here! I also enjoyed perusing your blog. Gearing up for Easter now, we are celebrating in six days…wishing you a delicious Easter! Thank you Debra, we try. I hope you have been enjoying your pea shoots this season.